The numbers and letters on an Apple Mac keyboard can wear off under continual use. If any key designations are badly worn, you should repair them by applying letter transfers. These are sold by art and craft suppliers and by some stationers. The letter transfers are easily damaged or even dissolved by resin so you must apply it quickly and smoothly (and quite thick) with a single brush stroke. Read on. Make sure you have everything you need before you begin. 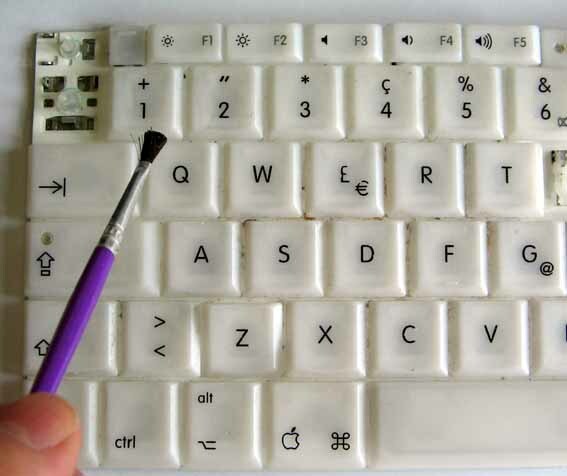 Wipe the key tops thoroughly with Isopropyl alcohol or methylated spirits to remove all grease and dirt. Mix a small amount of epoxy resin. Mix it thoroughly so that no unmixed resin is present. 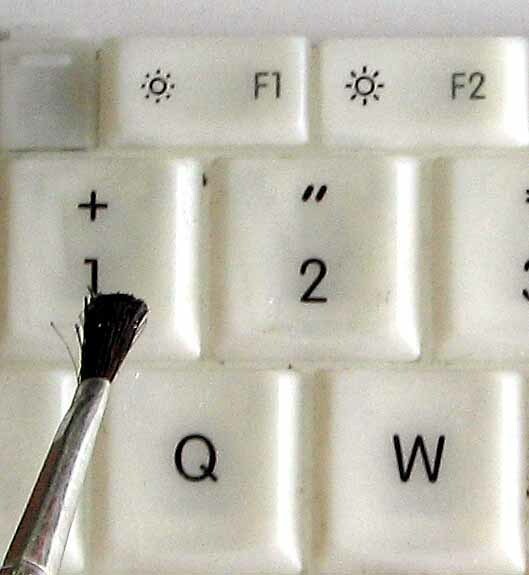 Use the paint brush to spread it across the top surface of each key so it at least covers the number or letter there. DON'T aim for perfection because your time is limited! 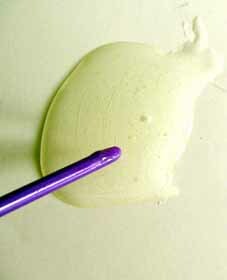 With fast-setting epoxy you have just 4 minutes. Before the 4 minutes is up, put a drop of neat detergent on the brush hairs and clean them under running water. Repeat 3 times. Dry the hairs. You can now mix fresh resin and continue. The end result (fo me) was not perfect, with some parts not covered by resin. However, you can see this only when the light reflects off the keys. Provided the actual lettering is covered, the rest of the keytop doesn't matter. When the job is complete, leave the keyboard for 24 hours in a warm place. If you need more working time, you could use standard slow-setting "Araldite" but this tends to have a yellow tint. You will also need to leave it for 2 or 3 days.